Toledo is one of Spain’s World Heritage cities, and is an example of the peaceful coexistence throughout history of such diverse elements as the Jewish, the Christian and Muslim cultures. The city is a veritable open-air museum. 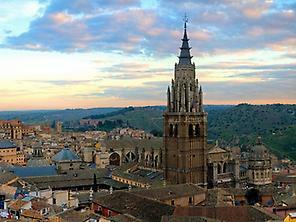 One day in Toledo always feels like too little. 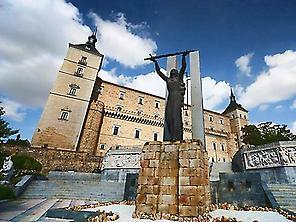 The famous “city of the three cultures” awaits us very near Spain’s capital city, barely 70 kilometres from Madrid. One of the reasons its historic quarter, declared a World Heritage Site by the UNESCO, is so impressive is because it still has exactly the same layout it had in the Middle Ages. A tour of its narrow streets will reveal an incredible and living monumental site, both inside and out. Arrival from Madrid Toledo can be reached easily from Madrid by rail, bus or road. We’ll take the train, as it’s fast and comfortable: the journey only takes 25 minutes, and there are trains leaving Atocha station every hour. We catch the 9:20am train, and by 9:45 we’re in Toledo. As we leave the station we turn right to catch a bus to take us to the historic centre. Buses 5, 6 and 22 leave us in the Plaza de Zocodover square, where we’ll find a Tourist Office. The route can also be done on foot: this is an uphill walk which takes about 15 or 20 minutes. A CONVENT CONVERTED INTO A MUSEUM (Approximately one hour – suggested timetable: 10:15-11:15am). We come to the Santa Cruz Museum, located on one side of the Plaza de Zocodover. This site consists of the old Hospital de Santa Cruz and the Santa Fe Convent, which have been refurbished and converted into a cultural venue hosting major temporary exhibitions. The entrance to the convent building is on Calle Santa Fe. We can see straight away how the more modern elements and materials have been integrated into the structure of the old convent building. Inside, there is also an immense glass window offering excellent views over the Paseo del Miradero avenue, the gardens of the new Conference Centre and the Tagus river. We come out into the Calle Santa Fe, and if we turn left, we come to the Santa Cruz Hospital building. It is well worth a visit, if only to see the courtyard, the marble staircase of Covarrubias and the enormous arches in its interior. Things to remember The museum offers guided visits for groups (minimum 8 people), by prior arrangement. They also arrange special visits for groups of children and senior citizens. A SNACK AT THE ALCÁZAR FORTRESS (Suggested timetable: 11:15–11:45am). This is a good moment to have a cup of coffee or a snack. There are several cafés and outdoor terraces in this area, but as we are so near the Alcázar fortress, we decide to make a stop at the café in the Castile-La Mancha library, located in one of the towers. If we look out of the window we can see a spectacular bird’s eye view of Toledo. THE GREAT CATHEDRAL (Approximately one hour and a half – suggested timetable: 11:45am–1:15pm). We leave the Alcázar and after walking through the streets for about five minutes we approach the Cathedral along Calle Cardenal Cisneros. This building is so imposing and has so much to see that we could spend hours here: the Monarch’s Chapel, the famous gold monstrance, the magnificent paintings in the sacristy, the choir stalls… We discover the curious tradition celebrated here every 15 August, on the festivity of the Virgin of Sagrario, when the custom is to drink from a variety of earthenware pots, jugs and glasses which are placed in the Cathedral and filled with water from the well in the cloister, as it is said to have miraculous properties. We'd better make a note for future visits. Things to remember Tickets to the Cathedral can be bought at the ticket office located opposite the Puerta Llana, in Calle Cardenal Cisneros. The best time to visit is from 2pm onwards, as there are usually fewer people. On Sunday during High Mass, you can listen to the majestic Cathedral organ. In addition, every day at 9am, mass is said according to the Mozarabic ritual in the Mozarabic Chapel. A particularly significant time to visit the Cathedral is during the festival of Corpus Christi, when its walls are covered with magnificent tapestries. TOLEDO FROM THE AIR (Approximately 45 mins – suggested timetable: 1:15–2pm). We leave the Cathedral and head towards the Plaza del Ayuntamiento square, where we find the two Renaissance buildings of the Episcopal Palace and the Town Hall. Along the street on the left, we come to the alley of the Cuesta de la Ciudad which brings us out at the Jesuit church (also known as the church of San Ildefonso) in the Plaza Padre Juan de Mariana. It is located at the highest point of the city, so this is a perfect opportunity to catch one more view over the clustered rooftops of Toledo from its towers. Looking towards the south, on the upper banks of the Tagus River, we see the Cigarrales mansions, the old recreational estates of Toledo's bourgeoisie, many of which have been transformed into luxury accommodation. (One and a half hours approximately – suggested timetable: 2–3:30pm). This is the moment to have lunch, and we are right beside Calle Alfileritos, full of bars and restaurants where we can sit and relax. Many of them have a particularly inviting and charming atmosphere, as they are usually old Toledo houses or mansions with several floors, which have been carefully refurbished in order to maintain their most characteristic decorative elements. From the menu, we suggest for example, cocido (chickpea stew), carcamusas (stewed pork with tomato), partridge, venison or any type of game dish. And to accompany our meal, any of the wines with the local Designation of Origin label, of course. Suggestion On the road to Alfileritos, we pass the building of the convent of San Pedro Mártir on our left, which today belongs to the University of Castile-La Mancha. The two cloisters on the inside are the ideal place to relax for a while in peace and quiet. A ROUTE AROUND THE OLD JEWISH QUARTER (Approximately three hours – suggested timetable: 3:30–6:30pm). After a good lunch, we set off for the old Jewish Quarter. It is about a 15-minute walk to the Plaza del Salvador square, where we can see the Municipal Archive in the modern style, the result of restoration works on the old church of San Marcos. The building is particularly unusual, among other reasons because the archaeological remains discovered during the building works are integrated into its structure. The church of Santo Tomé is in Calle de Santo Tomé, which leads out of this square. We enter the church in order to see the painting, “The Burial of the Count of Orgaz”, one of the masterpieces by the famous painter, El Greco. We continue on along Calle San Juan de Dios until we come to the El Tránsito Synagogue, also the site of the Sephardic Museum. After marvelling at the beauty of its plasterwork, we go on into the museum to learn more about the Jewish tradition in Spain. The next stop is another synagogue, Santa María la Blanca, which we reach along the Calle Reyes Católicos. The filigree and details on its capitals are astounding. Continuing on up this street we come to the imposing Monastery of San Juan de los Reyes, built by the Catholic Monarchs. After the tour, visitors will be surprised to learn that the monarchs apparently found it a little on the small side. Things to remember There are numerous crafts and souvenir shops all over this area. Some of these shops also have a workshop where visitors can see the craftsmen at work. 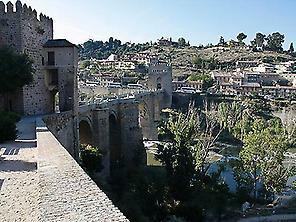 Particularly typical in Toledo are the items of damascene work, ceramics, leather and embroidery. Not to mention of course the famous Toledo steel swords: at number 19 of Calle Ciudad, very near the Cathedral, you will find the workshop of Mariano Zamorano, one of the last master swordsmiths still in existence. IN THE CONVENT NEIGHBOURHOOD (One and a quarter hours approximately – suggested timetable: 6:30-7:45pm). If we continue up the Paseo de la Virgen de Gracia avenue, we enter the convent neighbourhood. If you want to enjoy a gentle stroll, this is definitely the ideal place, as the streets here are havens of peace and quiet. Some of the convents even sell sweets and pastries, handmade by the nuns. The convents of San Antonio, San Clemente and the Agustinas Calzadas are just a few examples. From time to time if you look up you’ll see a series of raised walkways: these were used by the nuns to go from one building to another without being seen in public. We continue on foot towards the Mosque of Cristo de la Luz and the Puerta del Sol, from where we can see the church of Santiago del Arrabal and the inside of the Bisagra Gate. Things to remember Most of the convents are enclosed and are therefore not open to the public. However, they can be visited during Easter week thanks to the guided route organised by the Tourist Board. At this time of year there is also the chance to take the “Pasos Route”, so visitors can learn about the traditions behind the celebration of Easter Week by visiting the various brotherhoods and religious associations in the city.